Darjeeling: Gorkha Janmukti Morcha's Binay Tamang camp on Friday questioned Bimal Gurung's claim that he was "living in the jungles in suffering", a day after the party chief surfaced in Delhi. The Tamang lobby accused Gurung of trying to "play with the emotions of the hill people" with his "story of distress" while "living in luxury" in the capital. Anit Thapa, the second-in-command of the Binay camp, said in a written statement: "Bimal Gurung talks about being in the jungles for Gorkhaland and living a life of suffering. He is spreading lies to whip up emotions." "Along with 15-20 supporters, he has been camping in Delhi for long. He gave as much trouble as he could to the common people and is now living a life of luxury in Delhi," said Thapa. The Tamang lobby alleged that Gurung had always raised the "Gorkhaland slogan" only to stay in power. "His three agitations (2007, 2013, 2017) were raised only to stir emotions and stay in power. The agitation failed because of his lack of vision and direction," said Thapa. Gurung had on Friday told a group of journalists in Delhi that he was open to dialogue with the Bengal government. "This was exactly what we had suggested him on August 29. We had told him that in a federal structure, one has to talk to the state government and he has realised this five months later, albeit a bit late. If he had understood what we were trying to convey, then probably (many of) our people would not have died, many would not have been jailed," Thapa said. The BJP drew fire too. Hill residents have been angry at the stoic silence of S.S. Ahluwalia, Darjeeling's BJP MP, during the 104-day statehood strike last year. "Gurung has become a puppet of the BJP. If he thinks the BJP is sincere about statehood, he must seek a resolution from the BJP on statehood and the Darjeeling MP must table a bill in Parliament. The BJP is only playing with our emotions," said Thapa. Observers believe, however, that the BJP will not be able to table such a bill in Parliament given its interests in Bengal where the statehood demand is opposed. "The BJP is getting cornered in the hills," said an observer. Many believe it will be difficult for Gurung to refute the allegations. "Gurung is not finding any leader in the hills to put forward his case," said another observer. 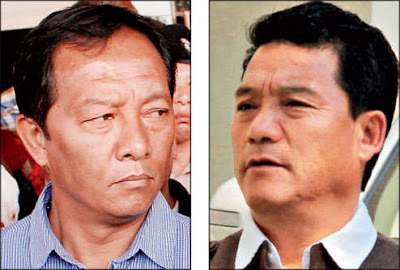 Gorkha Janmukti Morcha's Binay Tamang camp on Friday questioned Bimal Gurung's claim that he was "living in the jungles in suffering", a day after the party chief surfaced in Delhi.